Featuring a brilliant, round cut diamond solitaire in an elegant four claw setting, with diamond set shoulders, this beautiful polished 18ct White Gold ring is certain to be treasured with diamonds totalling to 1/2ct. Celebrate your engagement with The Diamond Story. Certificated by GSI. 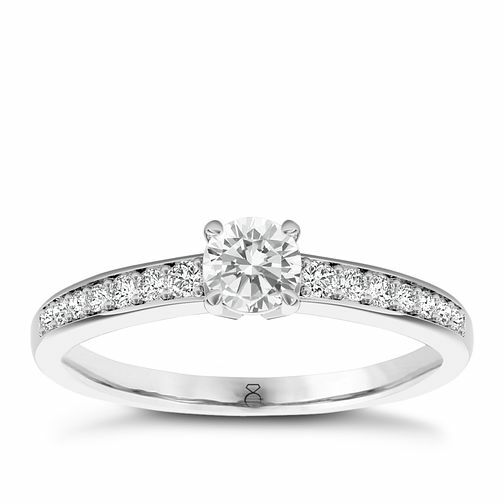 The Diamond Story 18ct White Gold 1/2ct diamond ring is rated 5.0 out of 5 by 2. Rated 5 out of 5 by Anonymous from Absolutely stunning ring I got given this ring when my fiancée proposed to me. I absolutely love it, it's so gorgeous and when people look at it when the lights on it and you can see the awe on their face from how much it sparkles and shines. Would definitely recommend this ring to anyone and Ernest Jones for their fabulous hospitality when dealing with my partner (the most indecisive person ever) thank you Ernest Jones! !